“At times you have to leave the city of your comfort and go into the wilderness of your intuition. What you'll discover will be wonderful. What you'll discover is yourself.” ― Alan Alda This year - no longer new and fragile, but not yet settled in its skin - has been defined by intuition. I've held my intuition at arm's length, examined it from all sides and shoved it back in the drawer. Only to take it out, shake it out, and embrace it at last. Intuition is what you turn to when you have exhausted the alternatives. It's the last entry name on your dance card, the partner ready with a firm hand and a sure foot to waltz you into the new day. We knew, way back that dreadful New Year's Eve day, that moving on was the only option worthy of our consideration. But we argued against it, fearing the unknown; fearful of losing the comfort and security which appeared like magic in our bank account every two weeks; of losing our identities, our community, our friends. But we knew. I knew the moment I heard Brendan's shaking voice on the telephone telling me he was coming home. He must have known several minutes before, standing up from his chair and standing up for his dignity. We would have to go. And we did. We moved on, in our own time. In our own way. Ten weeks later - our decisions made, papers signed, notices given, bags packed, boxes filled - we turned faces westward, toward the water, toward the mountains. Toward home. I gave in to intuition again last week, knowing that no matter how much you hope something will be the right thing, it can often be the wrong time. Or you're not the right person. So I rinsed off my gumboots and set them on the back patio. Yesterday morning, I walked down the hill to a new job, one my gut tells me is the better choice. Without tapping into intuition, creative writing is about as inspired as a grocery store list. It's what compels a writer return to the page day after day. By releasing our creative unconscious, by listening deeply to our instincts, we connect with our characters and through them, our true stories are revealed. I had a word count goal in mind for this first draft - something in the 110-115,000 range. A complete novel. Not a long one, but something of substance. Not that word count much matters in the dung heap of first drafts, but it gave me an end point from which I could see across a chasm of edits to less crappy drafts. I also allowed for Plan B - the Intuition Plan - that gave me an out if I felt Draft 1 was ready to be pillaged and plundered by my red pen in search of treasure worth salvaging. Not surprisingly, the Intuition Plan was put into effect 'round about the time I unpacked the last box, set my office to rights, and this long winter of our discontent came to a close. I had a beginning, a bunch of middles, and an end. I had started to write circles around myself, falling into plot holes and bringing the earth down around me in my attempt to clamber out. It was time to bring scenes together, to strategize and lay out, in systematic fashion, the story's arc. And to shake out the bogeys. April 1, (no foolin'! ), 90,000 words of Draft 1 became (magically!) Draft 2. While I was upending all other constants in my life, why not toss my writing routine into the mix? And hours - at all hours - of retyping and tweaking, shuffling pages and shaking my head. I worried that editing would mean an end to creating. Yet, despite the taking away that is inherent to the revision process, Draft 2 finds itself 5,000 new words the richer. And I'm still in the early scenes. I'm have a sense of what Draft 3 will entail (You didn't think this would be over any time soon did you? Honey, we're just getting started): the fleshing out and enriching of detail, the gathering of historical minutiae, most of which will be discarded in...Draft 4? I jest. Or not. 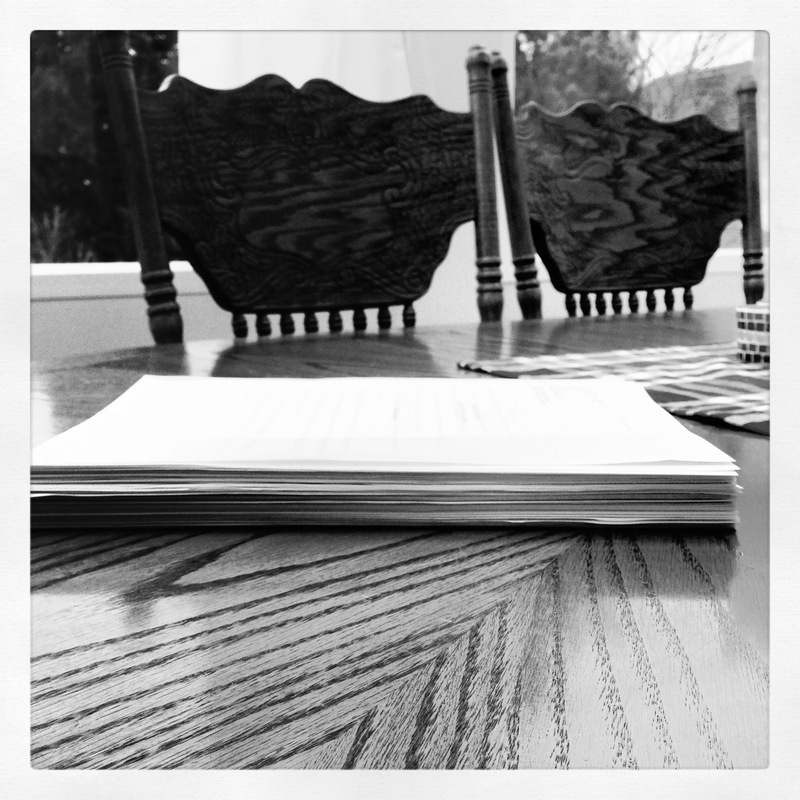 But Draft 1 - there it is, on the table, in black and white. Now being sliced and diced into something resembling a story by my fine point red pen. I'm still a bit wobbly - one month into this new life - my emotions giddy but uncertain, like a colt taking his first steps. The world around me is so fresh, brimming with the vibrant colors of new growth, the richness of blossoms and sea air, the madness of wind and the changing tides. I feel that delicious disconnect of being far away on holiday, in a place that is so beautiful you feel simultaneously calmed and energized. But I'm not on holiday. I'm in the wilderness of my intuition. And I think I'll stay here awhile.